- Each note can include text, pictures, videos, sounds or OLE objects. - Compress notebooks using ZIP deflate algorithm. - Unique features as Bookmarks and History of the last notes modified. - Stores and retrieves the last cursor position in each note, avoiding innecesary browsing. - Search and Replace features in the whole notebook. 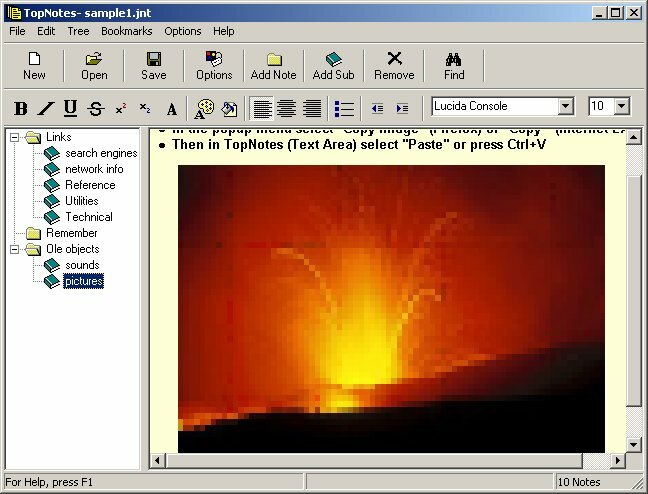 - TopNotes is an stand-alone program. Does not require additional DLL, VBX, OCX, or external databases. - Can use notebook files stored in a LAN. - Recognize web and email addresses and when doubleclicked launch default browser or email client. - You can minimize TopNotes in the tray. A must have program always available at hotkey. - Have all the information that you need in one place in a single file. Avoid losing information again. Qweas is providing links to TopNotes 1.2.3.3 as a courtesy, and makes no representations regarding TopNotes or any other applications or any information related thereto. Any questions, complaints or claims regarding this application TopNotes 1.2.3.3 must be directed to the appropriate software vendor. You may click the publisher link of TopNotes on the top of this page to get more details about the vendor.